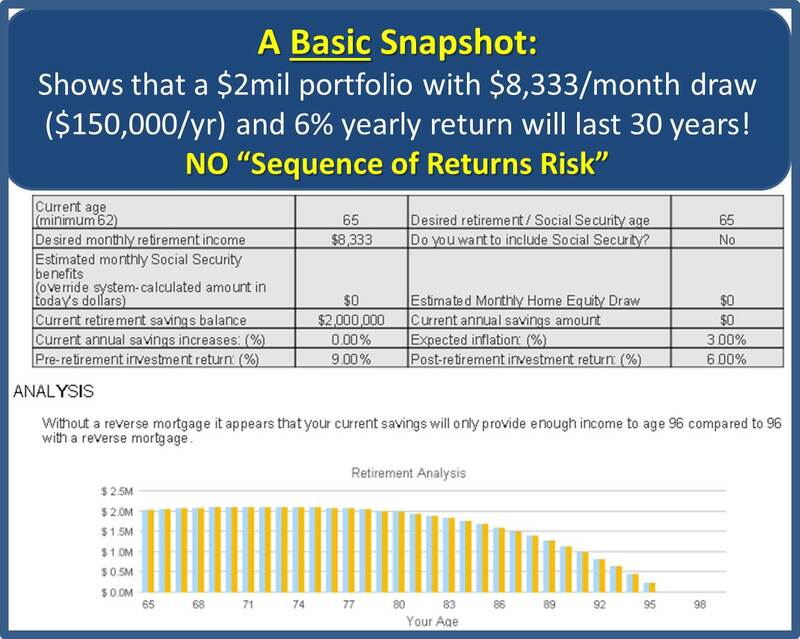 How can the devastating impact that Sequence of Returns Risk poses to a retirees savings be mitigated by a Reverse Mortgage? 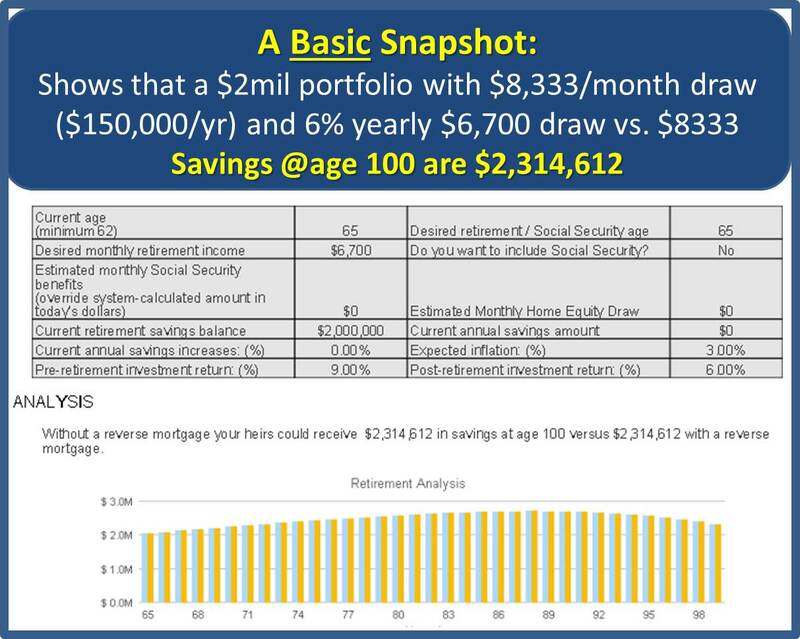 Every financial advisor understands the profound differences between the accumulation phase of a retirement plan and the distribution phase. Primarily the dangers that come with beginning account withdrawals during a bear market. Better known as Sequence of Returns Risk or it’s close cousin; Reverse Dollar Cost Averaging. 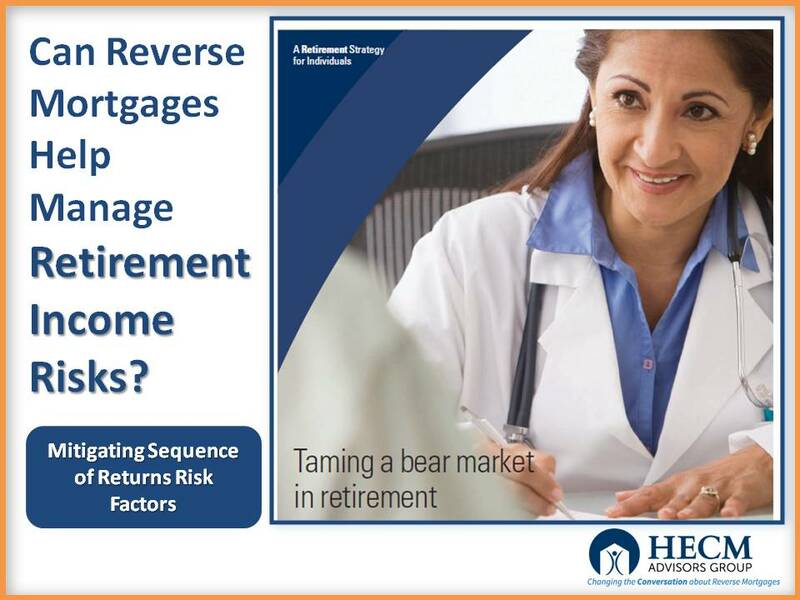 Today we want to look at how the HECM Reverse Mortgage can help mitigate some of those risks to accomplish genuine client satisfaction and savings that will last for all of their retirement. I have drawn from some of that work (available online) in order to highlight its brilliance and also to add 1 or 2 more possibilities that simple were not known to most advisors at the time. Clearly the Doctor has done well in preparing for her retirement. 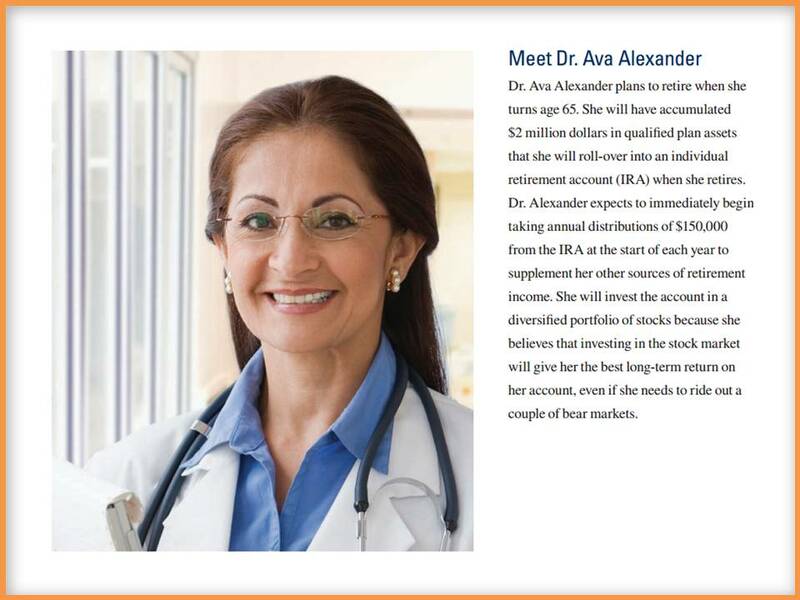 The challenge is that the timing sequence beginning her withdrawals come during a bear market. Thus tremendously depleting her savings longevity. What if the Client did not have an Insurance Policy to draw from? 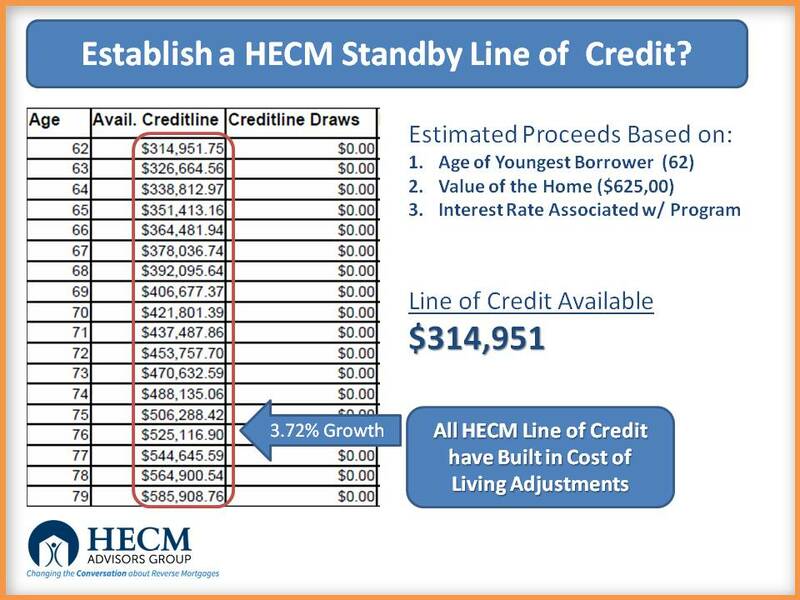 Can the HECM Line of Credit be used as a Strategy? 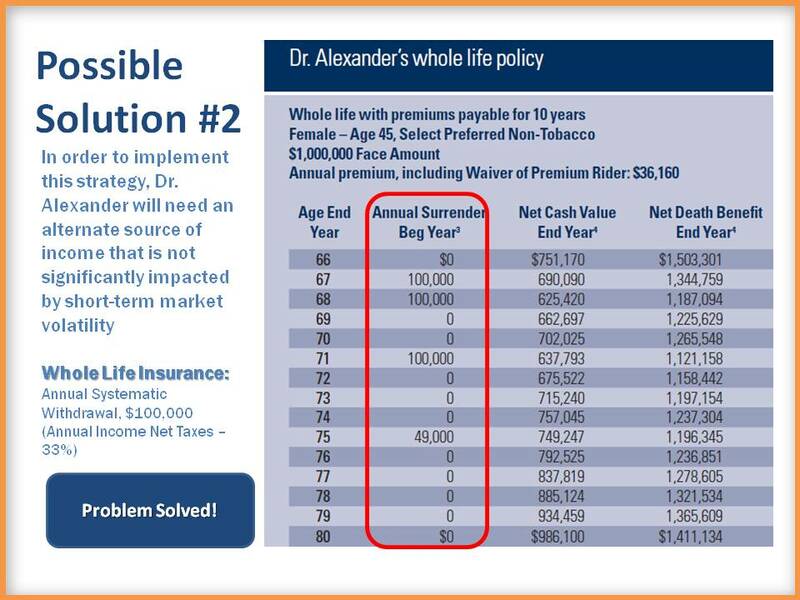 Dr. Alexander has a home valued at $625,500 and does not have a mortgage balance. She reduces the draw on the portfolio during a bear market and draws for the HECM. 1. 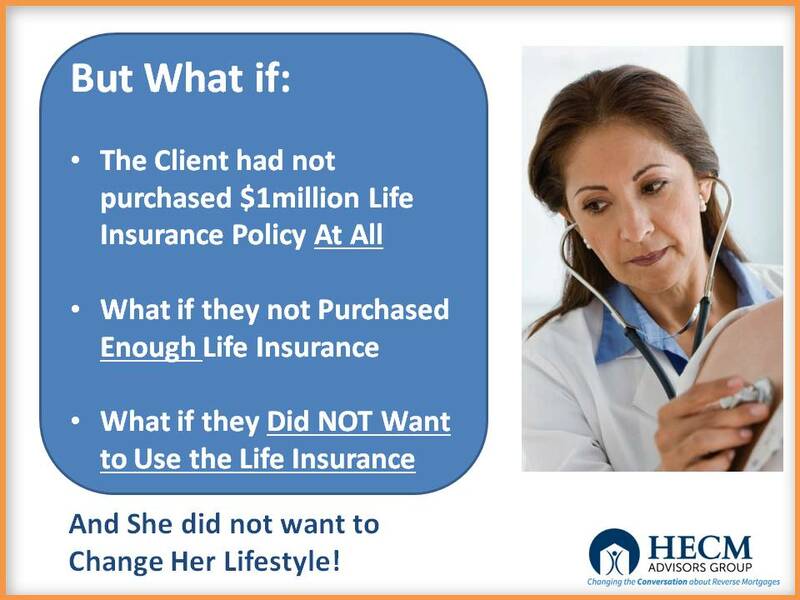 What if the Client Didn’t Have Enough Life Insurance? 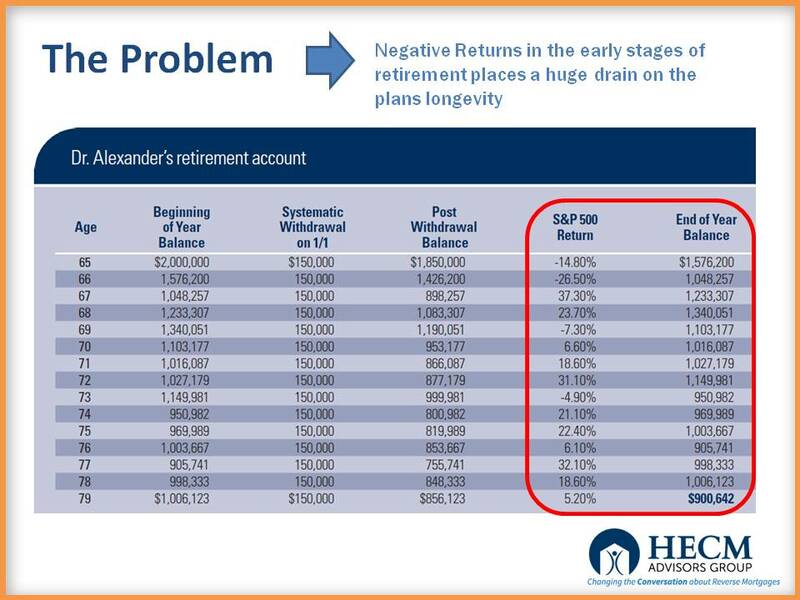 The HECM strategy would allow the client to pull some funds from the Life Insurance and some from the HECM, creating even more savings survial probalitly and longevity. This happens when the client has a strategic LEGACY based purpose for the Life Insurance or it has already been borrowed against. The strategy still works. 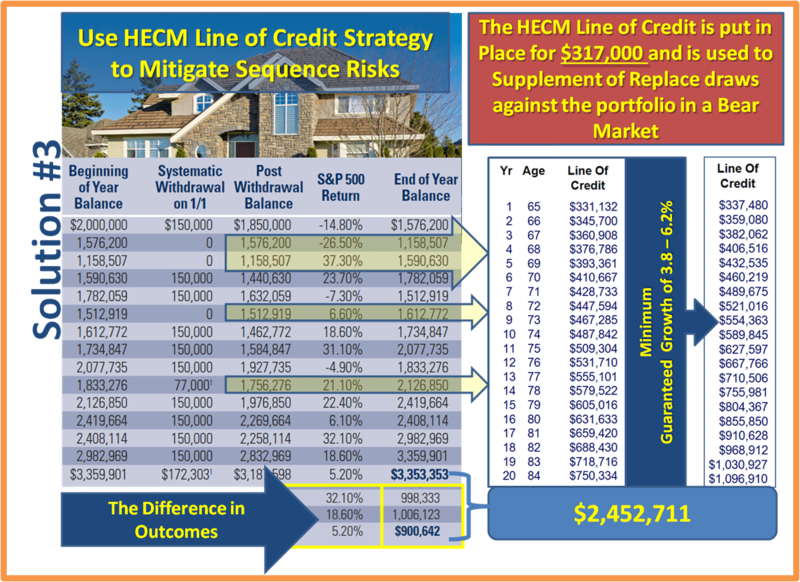 The client simply uses the HECM line to mitigate the portolio risks and leaves the Life Insurance in tact. 3. What if the Clients House was Not Free and Clear? 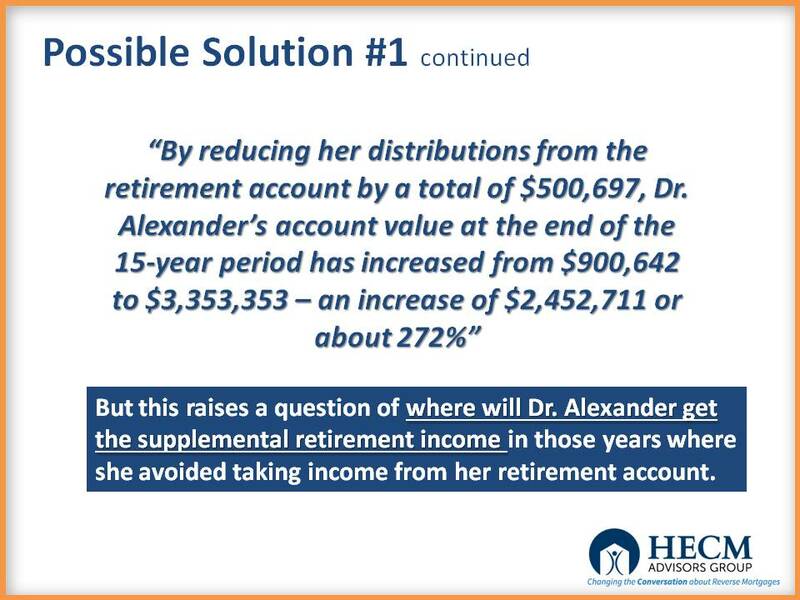 In ADDITION, the client still have a HECM Line of Credit of $115,000 to supplement portfolio withdrawals. 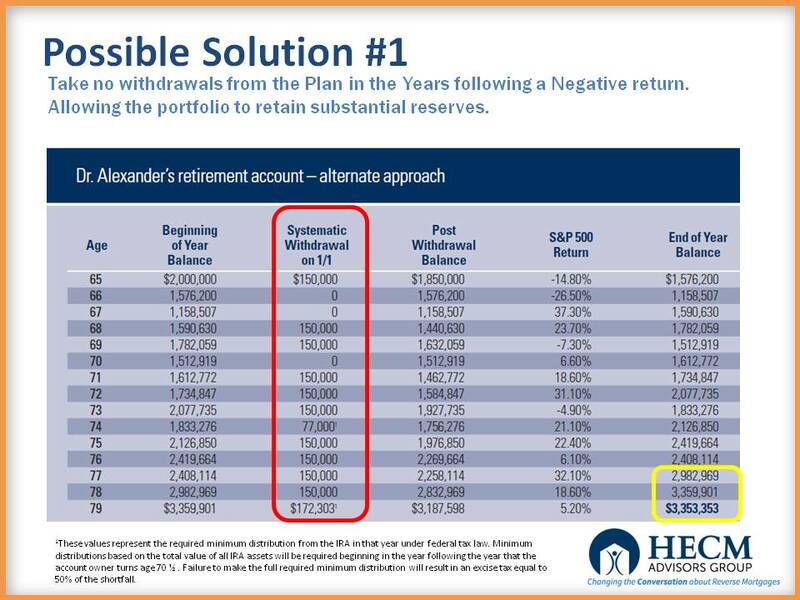 This is an excellent example of the negative impact that poor plan performance (early in the withdrawal stage) has on a clients retirement savings longevity. 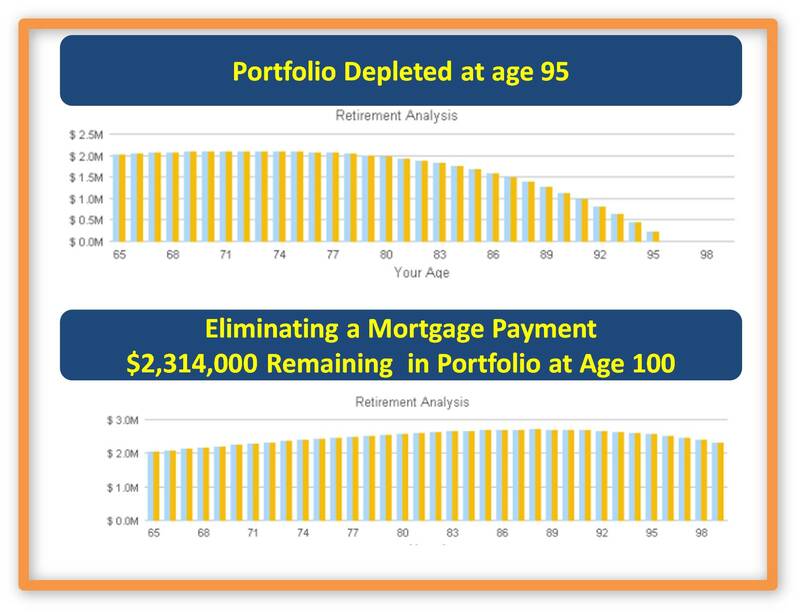 It also gives credence to the value of properly placed whole insurance into a clients financial plan, as well and a well crafted Reverse Mortgage strategy to supplement where insurance is not in place, not enough or simply not wanting to be used.